I recently enjoyed a treat. My niece visited and we sewed a fairy together. The needle, thread, and sequins fascinated her. "Look, Mom," she said, "I don't need glue!" After showing my niece the basics of the running stitch and adding sequins (which will soon be shared in our book), she took off and made it mostly by herself. 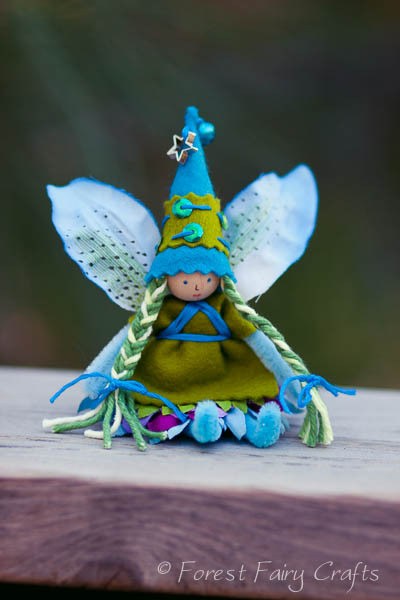 The beauty of sewing together was that I planned to make a fairy for her a few months ago. I would use pink, black, and maybe red because those are colors she wears often. Yet, yet she chose all blues and greens! She chose colors I would never have selected for her. And they inspired me! She especially liked the star on the fairy's hat. I liked the long stitches to attach sequins. They gave nice texture and decoration. We both decided that this fairy would wear short skirts instead of a long, full petal skirts. Better for dancing (my niece is a dancer). A parting image of her fairy looking thoughtful.